You already know it takes good nutrition to reveal your best body and have a great quality of life but I think you’ll agree that’s one of the biggest challenges. However, you can master this very easily, just like I did. The most critical key is to have an arsenal of easy, healthy and sinfully scrumptious recipes at your disposal – that you can eat, love and savor day in and day out – never feeling bored or tempted by the nutritionally empty calories of “fake health foods”. Makes your mouth water just thinking about it, doesn’t it? Many cookbook authors have an entirely different definition of “healthy” than you do. And so these recipes are loaded with sugar, fat, processed ingredients and calories – exactly the types of things you’re trying to AVOID! They’re impossible to make. Maybe the TV celebrity chefs can swing it, but not the average cook like you and me. And that’s because I’ve created and compiled some of my favorite healthy recipes. Every single recipe is nutritious. Each one is easy to make. And all of them taste so delicious you won’t even believe they’re good for your body and your health. My name is Belinda Benn. I’m the Founder of Aussie Transformation Coach. Every day I help thousands of people around the world change their bodies and lives through good nutrition and exercise. But just a few short years ago I was an office bound executive living on coffee and junk food who never worked out in her life! I was riddled with cellulite and overweight. I had a blind faith that the “regular” foods I was eating were safe, all the while not knowing that these mass produced products with chemical additives and artificial ingredients were compounding my horrible body composition, erratic digestion and premature aging of my body. My mid life transformation led me to eat better (as most people who want to lose weight generally know and sometimes do) – but as I dug deeper I found there’s a whole world of foods and “alternative” ingredients that enable our bodies to function at it’s best. Most people would consider these “super foods” because they liberate you and work to your advantage. You see, it’s not just about weight loss, it’s about optimizing your body’s circulatory, digestive, endocrine, lymphatic, muscular, nervous, respiratory and skeletal systems – giving you the fuel and the building blocks to function at a top level. Today, coming up on 50 years old, I still feel compelled to learn as much as I can to give myself the best leverage and maintain youth as long as possible through wise and unique nutrition habits. Living like this on a daily basis and seeing the results, I feel an obligation to share my secrets with you today – so you can experience these benefits in the exact same way. It wasn’t too long ago that most people didn’t know these types of foods and ingredients even existed. Today we have so many of these available but nobody really knows how to use them on a regular basis. They are still very new to all of us. Yes its great to know all the good things that you could be putting into your body but it’s a whole new level when you know exactly what to use, how to cook it and make these meals a regular part of your program. Think about how you feel after you’ve eaten a big piece of heavy chocolate cake or oily carb rich meal. You know you’ve messed up and a few hours later you feel yucky physically and emotionally. And the vicious cycle of emotional eating begins. When it comes to your foods…. Do you feel isolated, like you can’t enjoy the foods that others around you are? Imagine indulging in some of your favorite treats and sweets that actually taste more delicious than their refined chemical versions AND are good for you in a very powerful way. You’ll feel better because these foods benefit you physically, emotionally, and mentally, knowing you just put something super healthy into your body. By eating this way you can experience true optimal and vibrant health. Your mirror won’t lie, the proof will be there after you’ve given your body a chance to absorb these potent nutrients and see the visible effect they have on your body. I’ve even included special recipes that help you burn the fat, cleanse your body, give you an energy boost and much more! Looking after your body never tasted so good! You’ll Never Struggle with being able to have the foods you really want, now you’ll be able to. Your Emotional Battles With Food Will End because you’ll be able to indulge in things you want that are good for you. Holidays, Birthdays and Get-Togethers Will Be Fun and pleasurable because you’re not stressing over being tempted by unhealthy foods. Your Friends and Family Will Want To Eat The Same – making your efforts even more powerful and more accepted. You’ll become a positive influence on the people who know you best when they learn your secrets. Your Doctors Will Want To Know What You’ve Been Doing when you go for your next check up because your vital stats will improve – whether you’re trying to or not. Pure, Natural Ingredients (that most people consider “alternative”) are now the norm for you and I – and this is Sinfully Healthy….. Cooking extra special treats for yourself and your family, or for special occasions like parties, birthdays, casual get-togethers, BBQ’s and random social events is no longer a chore. ALL the stress is gone because you have these unique and amazing recipes. Your friends and family will be shocked and blown away when you tell them these meals are all nutritious. You cook these and everyone’s happy – you, your family and your body! 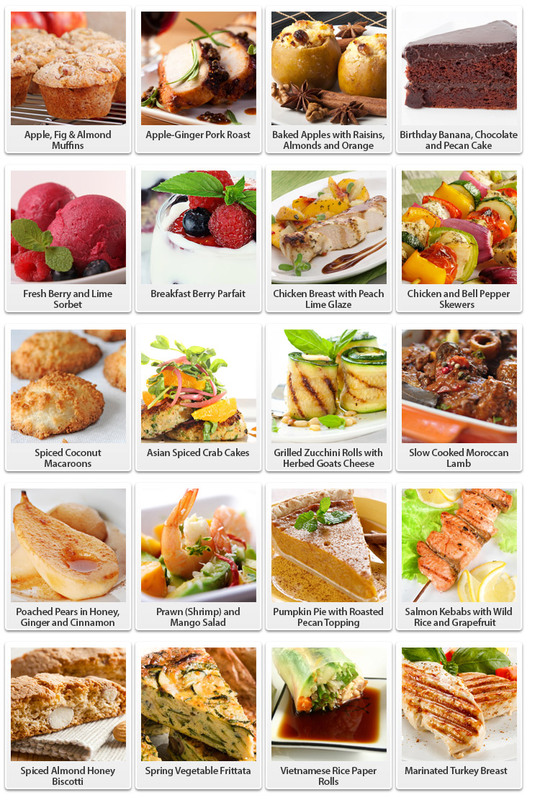 Over 100 Gourmet Recipes including ideas for every special occasion throughout the year. Whether it’s Thanksgiving, Christmas, New Years, Easter, birthdays or general entertaining – you’ve got it covered. Featured Menus for every occasion. Never again do you have to worry about what to cook or which ingredients you need, because it’s all done for you! Nutritional Breakdown for each recipe, including the amount of calories, carbohydrates, protein and fat per serving and a handy quick reference “High Fiber” guide. Imperial and Metric Measurements with conversion charts included – so there’s no guesswork. There’s nothing more satisfying than sinking your teeth into a moist, delicious cupcake with creamy frosting. And what’s even better is finding out the cupcakes are both delicious and nutritious – you’ll never have to turn down a cupcake or feel guilty about eating them again! Gourmet-Indulgence Cupcakes: Decadent chocolate. Rich berries. You’ll find all these tastes and more when you bite into these gourmet cupcakes – it’s hard to believe that something so rich and delicious is also nutritious! Metabolism-Boosting Cupcakes: You won’t believe that these mouthwatering cupcakes are helping you shed the fat. Yes, you really can indulge in these decadent treats, completely guilt free! Libido-Enhancing Cupcakes: Tasty, yes. A little naughty? Maybe. That’s because the secret spices in these cupcakes are designed to spice things up in the bedroom – get set to watch the sparks fly! Protein-Power Cupcakes: If you’re looking for easy ways to boost your protein intake, you won’t find a more delicious way to do it than by enjoying these mouthwatering protein cupcakes! Order The Sinfully Healthy Cookbook Package Today! Click Here!